Running through American artist Peter Coffin’s work is a playful investigation into how humans view things, and the manner in which art’s base concern is to both utilise and challenge this for its own ends. 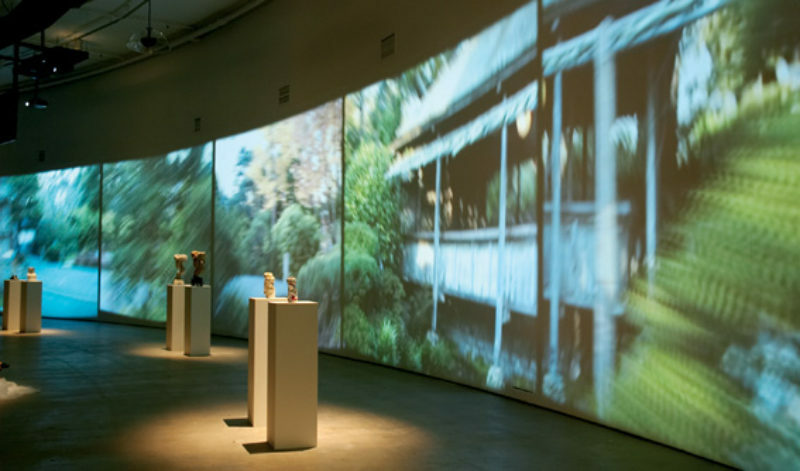 The site-specific installation for the Barbican’s bowed 90m corridor-like gallery, The Curve, consists of 16 projector screens covering the entire outer wall, showing a dream-like 180 degree pan of a traditional Japanese gardenscape working its way across the wall, continuously looped. The film’s point-of-view hovers above ground, sometimes high, sometimes swooping lower, creating a hallucinatory mood to the film, aided by additional audio tracks of footsteps and whistling played from overhead speakers. Interrupting the viewer’s path are 12 everyday objects rendered using a three-dimensional scanner and morphed, to mathematical precision, into surreal reimagings of the originals, which sit alongside on a second pedestal. This installation successfully goes further than previous works by Coffin, not only by being formally more complex, but also by stepping outside the confines of investigating ‘looking’ in the context of ‘looking at art’. The latter quality was also demonstrated in ‘Untitled’, 2009, conceived for the Tate Triennial, in which works from the gallery’s collection were displayed alongside a specially created animation and soundtrack. ‘Around, About Expanded Field (Sculpture Silhouette props)’, 2007, is a work in which instantly recognisable famous sculptures are reduced to sculptural silhouette cut-outs placed in front of a projected landscape. Here we have Coffin launching an ambitious investigation into the manner is which the world comes through to our mind, how our entire consciousness is at the mercy of our senses. The film has a certain recognisable realism to it, yet it is an impossible view: 380 degrees, unwrapped like a map of the world, on a semi-circular surface. The rendered objects are entirely mathematically possible, from a trumpet’s shape as it enters a black hole to the movement of the spin of compass made physically spatial (a deliberate nod to Renato Guiseppe Bertelli’s ‘Continuous Profile Head of Mussolini’, 1933). Yet, correspondingly they are alien and have the disconcerting feeling of a genetic mutation, a disruption to the Platonic form. It is the disconcertion that is the conflict of the piece, the fear of the possibilities of nature versus our attempts to control it. What is the neat, formality of Japanese garden design if not an attempt to train nature and mould it into our own psyche? Likewise the mathematical transformation of objects is symbolic of our meddling with the DNA of the natural world. This relationship between humans and nature is both age-old and contemporary, theological and scientific, and there might be an argument that there is little else to say on the matter. Yet Coffin’s work exposes the limitations of our seeing, suggesting that it is because of these limitations that our perceived mastery is just as illusionary as any artist’s endeavour.